Meat ants. You would be hard pressed to find an Australian kid who hadn’t at some point dragged a stick over their gravelly nest to, well, stir up an ants’ nest. Their aggressive response is the stuff of childhood legend. But just why do meat ants react so defensively? UNE PhD student Nirosha Ranawaka is risking vicious bites to find out. And she’s already made some interesting discoveries. 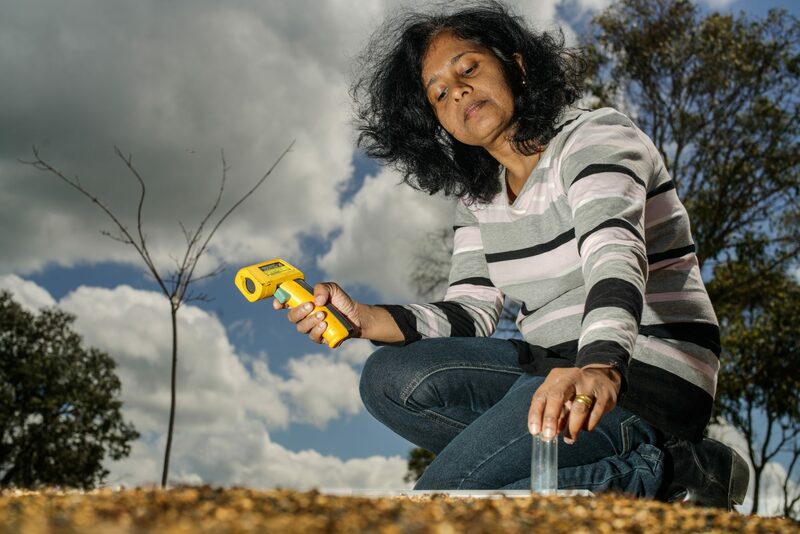 “I tried putting ants in enclosures and colour-coding them to test their behaviour, but marking them seemed to mask their natural aggression,” said Nirosha, who has mapped 150 individual wild ant nests along a climate gradient from Dorrigo to Tamworth in northern NSW. “I think the lower intensity of ants in captivity meant that they didn’t show their true colours. “In the wild, meat ants live close together in large numbers; they are very aggressive and commonly attack each other. Initially, Nirosha was bitten frequently in the name of science. “They are so sensitive,” she said. Last summer Nirosha tested ant responses by gently introducing “intruder ants” to wild nests, which can have several distinct entrances and galleries. “I am interested in whether the ants behave aggressively because they are not genetically related or whether it’s due to other environmental or ecological factors,” she said. Nirosha’s investigations will consider the complexities of population genetics and what part temperature changes may have on ant behaviour. “There’s a lot we don’t know about the gene flow between populations and how genetically related the ants are within a single nest,” she said. With the temperature rises predicted under climate change, Nirosha is keen to understand whether heat may trigger meat ant aggression and ultimately influence their survival prospects. And they may not be the only species at risk. Without ants, which feed on the excess honey dew secretions from eucalypt trees, sooty mould and other fungal infections can develop, inhibiting the trees’ photosynthesis. “Meat ants are a dominant native species, living over a large part of Australia, and they may play some important ecological roles that we don’t yet know about,” Nirosha said.